As humans, we like to talk about ourselves a lot. It’s natural. To us, we are the most important people in our lives and everyone else’s interests are but a mere speck of insignificance compared to what we’re doing and how we look and what our plans are. Any time we’re not talking about ourselves we write about ourselves, either on Facebook or Twitter, or a completely separate website devoted entirely to themselves… Ahem. Yes I am, as you may have gathered, more guilty than others in this respect but I’ve had an strange realisation about this recently. This saves a lot of time as I’m sure you can imagine, but you also become very used to omitting pronouns from all your sentences. This has had a really bizarre effect in that I have become acutely aware of how often people say “I” when talking in English. Suddenly the word “I” seems uncouth and unnecessary and the more people say it, the more self-obsessed they sound. If this is how I feel after 1 year of study, imagine how self-obsessed we must sound to the Japanese. 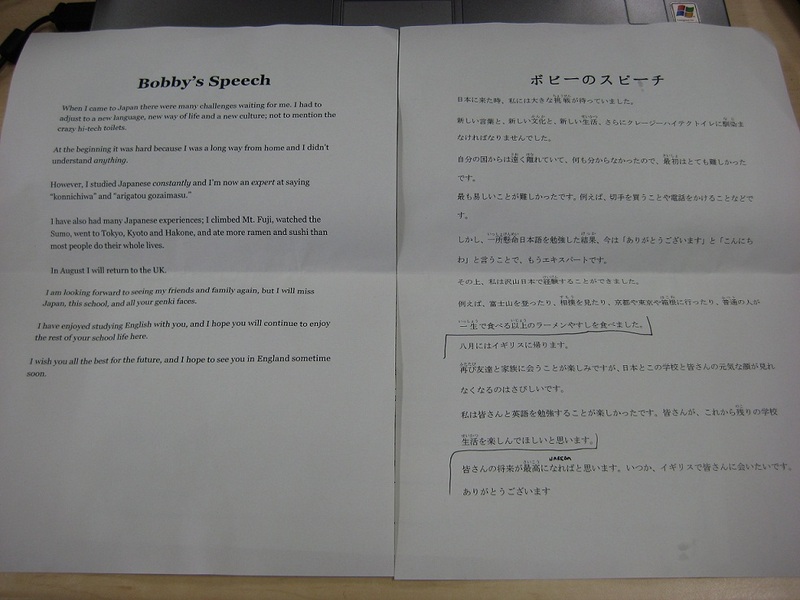 This entry was posted in Default and tagged japanese, language on July 2, 2011 by Bobby.